Ideal Crissy grow hair doll, 18"
Ideal Novelty and Toy Company originally produced teddy bears, in the 1930s they gave us Shirley Temple dolls, plus others, They were first in their industry to make hard plastic dolls after World War II. In the 1970s Ideal gave us the grow hair Crissy family of dolls. Ideal's dolls are made of; wood, cloth, composition, hard plastic, vinyl and magic skin and are considered to be very good quality. 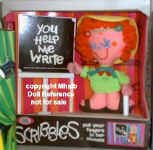 Ideal Toy Company was acquired by the CBS Toy Company in 1982, which eventually merged with Mattel in 1992. 1969-1974 Ideal Crissy doll, 18" tall, the Crissy Family of grow hair dolls; Crissy, Kerry, Tressy, Brandi 17 1/2" tall, Velvet, Cricket, Dina, Mia & Tara 15" tall, Cinnamon 11 1/2" tall and Baby Crissy 24" tall. Some dolls came in both a white or black version. Crissy is 18" tall, sleep eyes, long rooted deep rusty auburn or black hair that can grow even longer, open mouth with a wonderful smiling face, shown here in original outfit of a lacey party dress with ribbon tie and flower hair accent with matching shoes, came in several versions over the years and came as a black Crissy. Photo courtesy of Tara Salvatore. 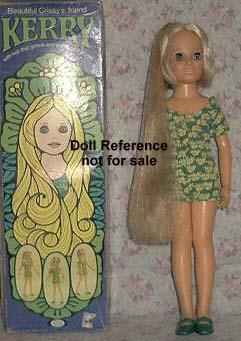 1970 Ideal Kerry doll, 17 1/2" tall, friend of Crissy and part of the Crissy grow hair dolls. 1970 Kerry doll, 17 1/2"
1970-1971 Ideal Tressy doll, 18" tall, friend of Crissy part of the Crissy family of grow hair dolls. Came as both white or black dolls. 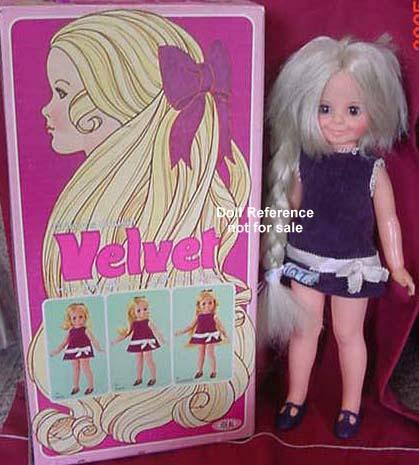 1970-1974 Ideal Velvet doll, 15" tall, violet eyes, the younger cousin of Crissy in the Crissy family of grow hair dolls. Also Dolls; Talk Velvet, Movin Grovin Velvet, Beauty Braider Velvet & Velvet with Swirly Daisys, (last three dolls also came as black dolls). 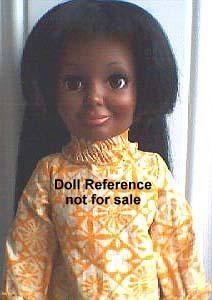 Left, 1973 Beauty Braider Velvet Black doll, still with violet eyes, also came in a white version. 1971 Ideal Cricket doll, 15" tall, part of the Crissy family of grow hair dolls, Velvet's friend. 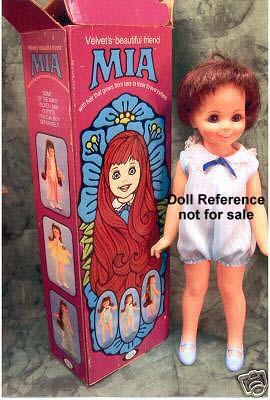 1971 Ideal Mia doll, 15" tall, part of the Crissy family of grow hair dolls, Velvet's friend. 1971 Ideal Belly Button doll, 9" tall, all vinyl, baby type doll with bent legs, rooted hair, white or black, dressed in a romper. 1971 Belly Button doll, 9"
1971-1972 Ideal Bizzie Lizzie doll, 17 1/2" tall, soft vinyl head with blonde rooted hair, sleep eyes with real upper lashes & painted lower lashes, closed smiling pink mouth, hard plastic jointed body, wore a pink dress & had a heart shaped plastic necklace with her name, came with ironing board, iron, feather duster, manual carpet sweeper & her battery operated pack came in a pink plastic toolbox, doll marked on head 1970, doll marked on body 1971. 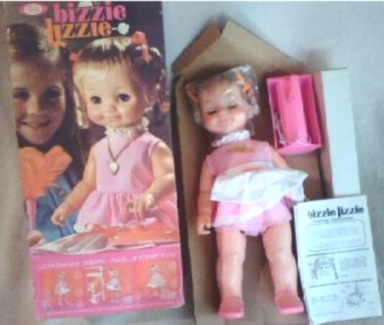 1971 Bizzie Lizzie doll, 17 1/2"
1971 Ideal Patti Partridge doll, 16" tall, performing hand doll or puppet like, with a squeeze mechanism on dolls back to make her; smile, clap hands or yawn, vinyl head with bright redish orange short curly rooted hair, sleep eyes real upper eyelashes, open mouth with two upper tooth, cloth stuffed body with partial soft palstic limbs. Unknown how doll is marked. Box is marked: IDEAL NO. 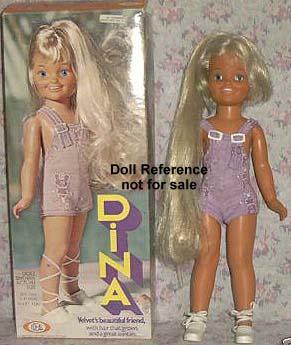 0543-9 EXCLUSIVE DOLL. From the 1970s TV show The Partridge Family, youngest daughter Tracy Partridge's doll. 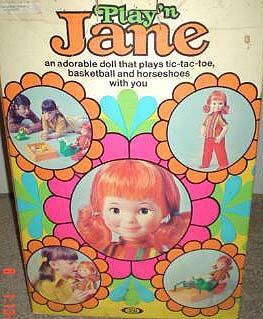 1971 Patti Partridge doll, 16"
1971 Ideal Play'n Jane doll, 17' tall, doll plays games with you, rooted hair, sleep eyes, toddler hard plastic body. 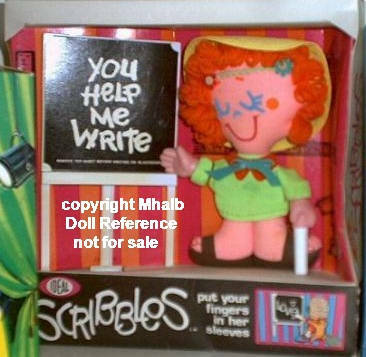 1971 Play'N Jane doll, 17"
1971-1972 Ideal Scribbles doll, 9" tall, all cloth doll with red yarn hair yarn stitched facial features, was a type of puppet that you put your fingers in the dolls sleeves and a child could write on the included chalk board. 1972-1974 Ideal Cinnamon doll, 11 1/2" tall, part of the Crissy family of grow hair dolls. 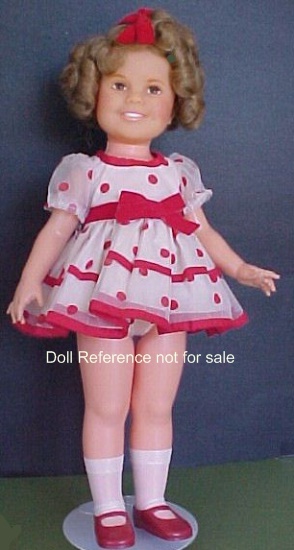 Velvet's little sister, came in a black or white version, has rooted auburn grow hair, blue painted eyelashes, orange and white polka dot two piece playsuit and orange t-strap shoes. 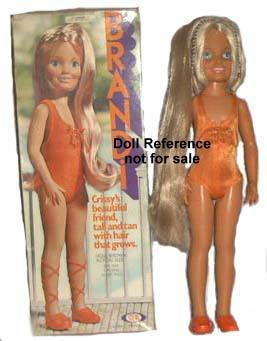 1972-1973 Ideal Brandi doll, 17 1/2" tall, part of the Crissy family of grow hair dolls, Crissy's friend. 1972-1973 Brandi doll, 17 1/2"
1972-1973 Ideal Dina doll, 15" tall, part of the Crissy family of grow hair dolls, Velvet's friend. 1973-1976 Ideal Baby Crissy doll, 24" tall, white or black, all vinyl, size of a nine month old infant, grow hair has a pull ring for her grow hair feature, most of these dolls had a knob, brown eyes. The white version came in a pink romper and the black version came as shown in a lavender romper. 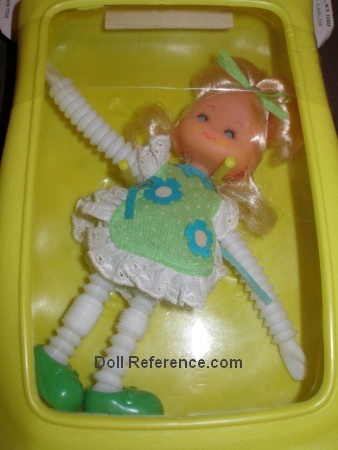 Doll was reissued in 1981 in a white romper with yellow flower appliqué for both dolls (doll shown). Part of the Crissy family of grow hair dolls. Baby Crissy is marked GHB-H-225 1972. 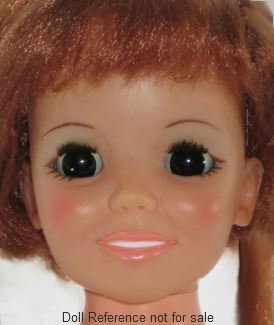 1981 Baby Crissy doll, 24"
1973-1975 Ideal Shirley Temple doll, 16" tall, vinyl head with rooted blonde hair, brown painted eyes, open smiling mouth with teeth, plastic jointed body, came wearing the while with red polka dot dress from "Stand Up and Cheer". Four additional outfits were available separately in 1974-1975. Marked on neck: 1972 IDEAL TOY CORP. ST-14-H-213 Hong Kong. Mark on back: 1972 2M-5534-2. 1973-1975 Shirley Temple doll, 16"
1973 Ideal Stretchie doll, 8" tall, vinyl head with rooted hair in six colors; aqua, blonde, brunette, green, pink or yellow, painted faces, closed smiling mouth, plastic accordion pleated arms with mitt hands and legs with plastic shoes attached, that a child could twist, turn or tangle, wore a cotton sun dress, came packaged in a plastic pocketbook. 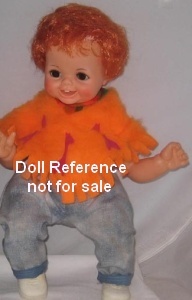 Doll marked 1973 Ideal. 1973 Ideal Stretchie doll, 8"
1974-1978 Ideal Rub A Dub Dolly doll, 17" tall, black or white version, rooted hair, open mouth, baby type, doll marked on head: © 1973 IDEAL TOY CORP RAD-16-H-233 doll marked on back: © 1973 IDEAL TOY CORP Hollis NY 11423 RAD 17 2M-5852-01. 1974 Rub A Dub Dolly doll, 17"
1974 Ideal Tiffany Taylor doll, 19" tall, see the Tiffany Taylor page for more details. 1974 Tiffany Taylor doll, 19"
1976 Ideal Tara doll, 15 1/2" tall, only came as a black doll, you turn a knob on her back and her hair grows longer, she is part of the Crissy family of dolls and shares the fashions with other 15" dolls; Cricket, Dina, Mia & Velvet. Tara is wearing her original yellow and gingham check two piece pantsuit with a white placket front and appliqué, edged with ric-rak and yellow cut out shoes. 1976 Tara doll, 15 1/2"
1976 Ideal Joey Stivic doll, 15" tall, All in the Family TV show, Archie Bunker's grandson, baby boy doll, anatomically correct. 1976 Joey Stivic doll, 15"
1976 Ideal Tuesday Taylor doll, 11 1/2" tall, see the Tuesday Taylor page for more details. 1977 Magic Hair Crissy doll, 19"
1978 Ideal Kissy doll, 3" tall, three dolls in the series, all vinyl dolls with a jointed body at neck, shoulders and hips, rooted hair in blonde, brunette or auburn, painted eyes, open mouth to press on a surface and leave a non-toxic, cleanable, kiss mark. 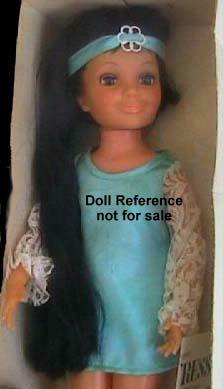 Doll marked Ideal 1978. 1978 Ideal Whoopsie doll, 13" tall, blonde rooted pig tail hair, when her tummy is squeezed she squeals and her pig tails go up, squeezed again and she squeals and they go down, marked on head: Ideal Toy Corp. Hong Kong 1978 H-298 and on back B-66. 1981 Ideal Laura doll & Robin doll, 11 1/2" tall, vinyl fashion dolls with soft foam body. Had twelve outfits available separately. 1981 Ideal Loni Anderson doll, 11 1/2" tall, celebrity jointed posable fashion doll, rooted platinum hair, painted facial features, wore a one piece sleeveless red dress, white open toe high heel shoes. TV personality from television show WKRP in Cincinnati. 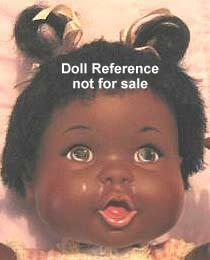 50 or fewer dolls were produced, it is unknown if, how dolls were marked.